Looking to pick up n early holiday gift for someone you know or maybe for yourself? 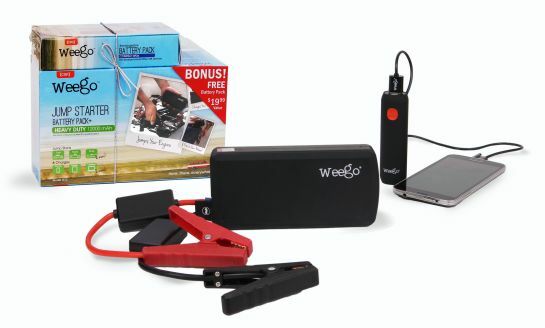 The Weego Jump Starter Battery+ bundled with a free Weego smartphone charger is coming and it makes a great gift for anyone. Weego Jump Starters are offered in three sizes. The JS6 Standard is capable of starting gas engines up to 4.6L and diesel engines up to 2.4L; the JS12 Heavy Duty model can easily start gas engines up to 6.4L and diesel engines up to 3.2L, and the JS18 Professional can start gas engines up to 9.6L and up to 4.8L diesels. Weego features built-in circuitry protection, an auto-off feature and jumper cables with both a fuse and diode to ensure user safety, as well as protection for the unit. Weego jump starters offer up to 1,000 charging cycles (a full charge plus full discharge), have an operating temperature from -4 to 140-degrees Fahrenheit (-20 to 60-degrees Celsius), are independently lab tested, and are backed by a "crazy-long" 18-month warranty from a company that's been in business for over 50 years. Weego's high-quality components and durable construction guarantee long-lasting performance too. Lithium-polymer batteries only lose up to 2% of their charge per month when stored, so it's possible to leave Jump Starter Battery+ in your vehicle for a year or more and still have enough power to start the engine during the 2016 holidays!